Underpants! Just what I've always wanted! I'll wear these tomorrow. He was so sincere, I actually wasn't sure for a moment if he was pretending or if he'd misunderstood the joke. Still, it was time for bed and off he went. Then on Christmas Day, BB opened up one of his Stocking Gifts to find six pairs of underpants. I was really pleased because I thought he was really excited until Daddy pointed out that he was just doing what we had practised the night before. At least I had the snacks at my Father In Laws house to look forward to. Every year when we go to my Father in Laws home on Christmas Day, his wife has made a HUGE range of Christmas goodies. Some of them are Gluten free because she is amazing and a complete genius in the kitchen and loves to feed everyone! 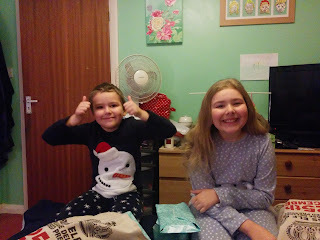 This year, she did something slightly different and had some little bags so that instead of BB and Tops pigging out completely and us needing to react to BB's rising blood sugars because he'd eaten more than we had estimated, he could take it home and eat it slowly over a couple of days. It was his last hurrah for a while. BB was told by us that over Christmas, we'd let him have a few more treats than normal, but come the New Year, or more specifically, come the Monday after Top Ender's birthday, we'd be back to our stricter low cholesterol, no snacking and no junk diet. I hate trying to live healthily. Living healthily, isn't something I hate. Living healthily is at times challenging. Living healthily is trial and error. Living healthily is the way that I want to live because I want to be healthy. I want my family to be healthy, and who doesn't want to eat more vegetables?! And I guess that brings me to the end of my blog post... did it live up to the title? !